The Series 50 is without doubt the most professional commercial pop up gazebo on the market, offering extreme strength and durability. The framework is made from aluminium, light weight, high strength with excellent corrosion resistance. The canopy and sidewalls are made from 500gsm (700/800D) heavy duty polyester PVC coated fabric,100% waterproof. The canopy and sidewalls have been tested and passed BS 7837 1996 fire rating. Each gazebo can be supplied with a certificate upon request. 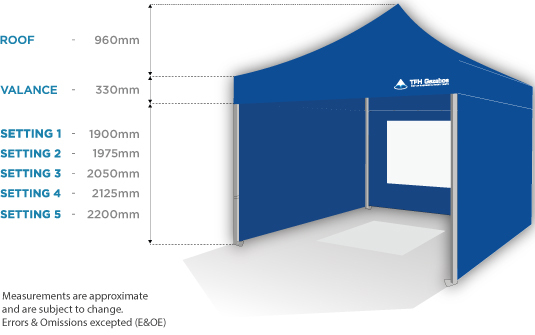 This 3m x 4.5m Pop Up Shelter is very versatile giving that little bit of extra space over the 3m x 3m gazebo, easy to set up and transport, and widely used for Market Trader Gazebos and by Councils, Emergency Services, Motorsport, Food & Drink Catering, Hog Roasts, Promotional & Trade Stands. No tools required, just extend the frame open, fit the roof cover and extend legs to desired height. All parts are replaceable with Spare parts readily available. excellant product, well made and sturdy, well pleased working well. Excellent bit of kit, really well built, service was a1 ordered online on sunday delivered tuesday thankyou. After looking for a multi purpose gazebo recently I was pointed in the direction of 'tfh gazebos' and I must say that from the outset all communications and dealings have been of the highest order. The gazebo itself which I had printed on three sides is of the highest quality and can not be faulted in any way at all. It is easy to put up and down and the little touches including the quality of the carry bag make this gazebo a real market leader in my opinion. The standard of the materials used is also a real bonus adding to the appeal of the product. Add to this the prompt and professional service I received at all times during the buying process and beyond, I would not hesitate to recommend TFH Gazebos to anyone looking for such equipment.